Here are some of my favourite Easter food and decorating ideas - designed for big and little kids. I've sourced all my food from Woolworths - including the fresh seafood. Lazy afternoons filled with family, love and a beautiful shared table…this is how I like to entertain. I hope these ideas inspire! Wishing you and those you love a safe and happy Easter. A TABLE THAT TELLS A STORY. Make the table instantly prettier by using a coloured napkin. Here I’ve used soft pink linen wrapped in raffia to link back to the tulips and roses. For an Australian element I spray painted some gum leaves gold and added to each napkin for a touch a of Easter glam. Few things are as Australian as the gum tree. Here, I have used two types of eucalyptus from the garden to create beautiful and inexpensive table greenery. And then I added some tulips from the fresh flower section at Woolworths for colour. Little Things For Little People. I like to add classic party favourites like cute cups, glass bottles and paper straws to my Easter Brunch for the kids. It elevates it from a regular family catch-up to something special. 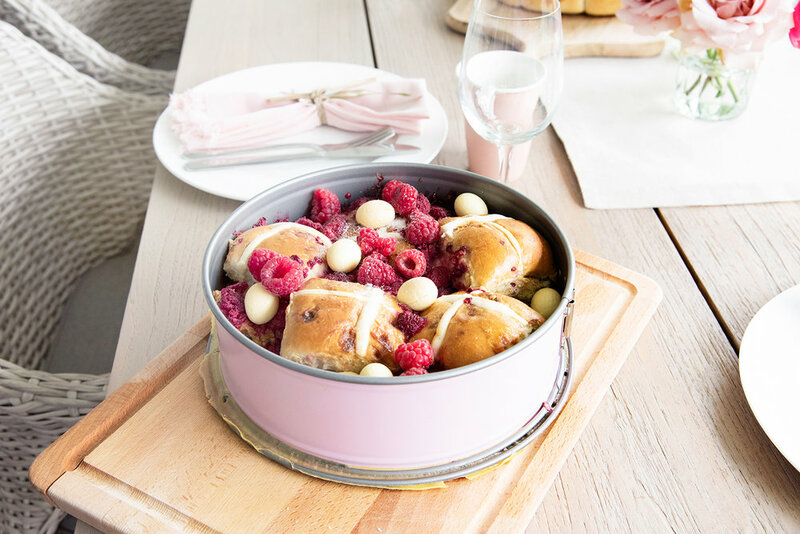 White Chocolate & Raspberry Hot Cross Bun Pudding. Preheat oven to 160C. Lightly grease an 8-cup ovenproof dish. Spread the cut side of each bun, half evenly with butter, then jam. Arrange in the prepared pan, alternating the jam-side up with the cross-side up to form a pretty pattern. Sprinkle with raspberries and white chocolate eggs. Whisk the egg, milk, cream and sugar together in a large bowl. Next pour the custard mixture evenly over the buns. Set aside for about ten minutes to soak. Place the dish in a large roasting pan. Pour enough boiling water into the pan to come halfway up the side of the dish. Bake for 35-40 mins or until custard is just set. Serve warm with cream and extra easter eggs. Egg Hunts, Dress Ups & Fun. We were never not going to dress up for this one. Any and every excuse to wear tulle. Half the fun of an egg hunt is making it special and taking it outside. Thaw puff pastry. Meanwhile, combine milk and egg in a small jug. Whisk well. Combine pork mince, beef mince, onion, carrot, garlic, parsley and sauces in a large bowl. Season with salt and pepper. Divide mixture into 8. Roll up pastry to enclose filling, finishing seam side down. Take a fresh sheet of pastry and cut small strips to create a hot cross bun pattern on top of each cut (as per above image). Brush with egg mixture. Place each one seam side down on prepared tray. Repeat with remaining mince mixture, pastry and egg wash. These great chocolate easter egg mix packs take the angst out of hunting when there are multiple kids. Different colours, different sizes but everyone gets the same amount. CLICK TO BUY: Woolworths Easter Egg Hunt Mix, $5. Seafood, lamb and prawns are my picks for a classic Easter brunch. Woolworths fresh seafood makes it very easy for people in regional areas (and those that can’t get to the fish markets) to get a great range and super fresh produce. I love a side of baked salmon (this is a great recipe) to form the hero of the table. If you’re new to cooking seafood, try the Woolworths Bag & Bake option at the fresh seafood counter. Simply choose your seafood, pick a delicious marinade sauce and Woolworths staff will combine in an oven safe bag- then all you have to do is bake the fish in the bag (as instructed) and you will have goof-proof delicousness. Woolworths Bakery makes the dessert end of Easter entertaining simple with a host of ready-made pies and cakes that no one will know you didn’t make yourself. They have also added some seriously delicious gluten-free options that will make catering for large groups much more inclusive. The Woolworths Free From Gluten Dairy Free Chocolate Cheesecake, (above) has become a firm favourite in our house. It’s perfect topped with fresh raspberries. Check out the refrigerated section of the Woolworths Bakery for a large selection of table-ready treats. Hot Cross Bun Milk Shake.